Those who live in the aromatic shadow of Mount Tamalpais, how I envy you! To step out one's door and onto a trail; life in the bay area doesn't get any better than that. There are many little trailheads and paths originating in the towns surround Tam; I love finding the locals-only spots. 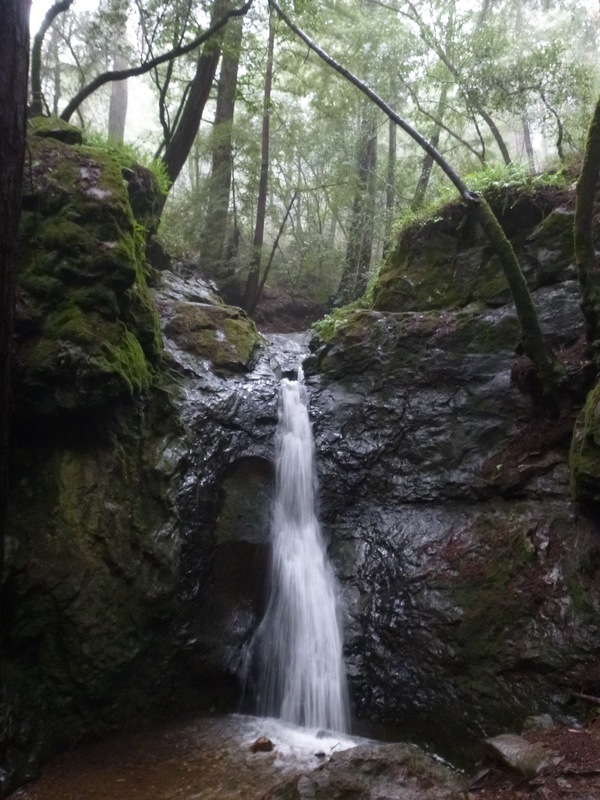 Yesterday I explored a little neighborhood secret in Mill Valley: Cascade Falls. Cascade Falls in Fairfax is better-known, but this one, within walking distance of downtown Mill Valley, is more dramatic. Unfortunately the Mill Valley cascade doesn't offer a substantial hike; it's only a short walk from a small pullout on the side of Cascade Drive. To stretch this walk, you could start from downtown Mill Valley and walk, via Throckmorton and then Cascade Drive, to the trailhead. This is a pleasant and mostly flat mile (one way). There is a small pullout, with room for 3 cars, at the trailhead. Side of road parking is often available on Throckmorton near the junction with Cascade Drive, a 5 minute easy stroll from the trailhead. Note that Cascade Drive is a narrow road, so take it slow and watch for pedestrians. Also be sure to respect the neighborhood and do not block driveways. If you park on the side of the road you must be off the pavement. From the parking pullout on Cascade Drive, the trail heads into deep shaded woods of Douglas fir and redwood. 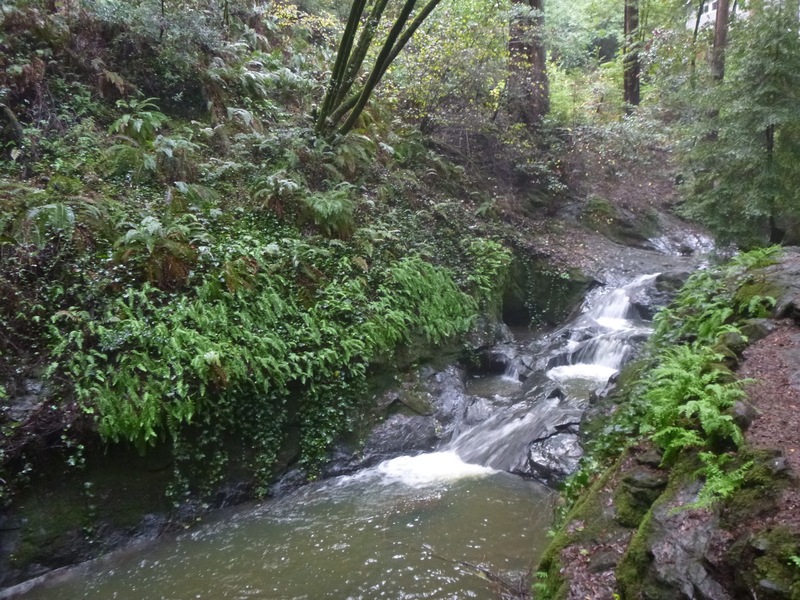 Cascade Creek, which originates far up on Tam's southern slopes, runs merrily along to the right. When I visited on the first day of December mushrooms were pushing through the leaf litter everywhere. After less than a minute the trail forks (the path to the left climbs to an overlook above the falls, then forks again -- both segments end at Lovell Road). Head to the right, cross a bridge, and you'll arrive at base of the falls. The 15 foot cascade apparently runs (or trickles) all year, but for the most gush arrive after several days of heavy winter rain. After enjoying the waterfall, consider a side trek along Old Mill Creek. Return to the trailhead, then cross Cascade Drive (follow the path of Cascade Creek as it passes under the road). The path here is not signed but is easy to follow. Initially the creek is on the right but a bridge delivers you to the other side. 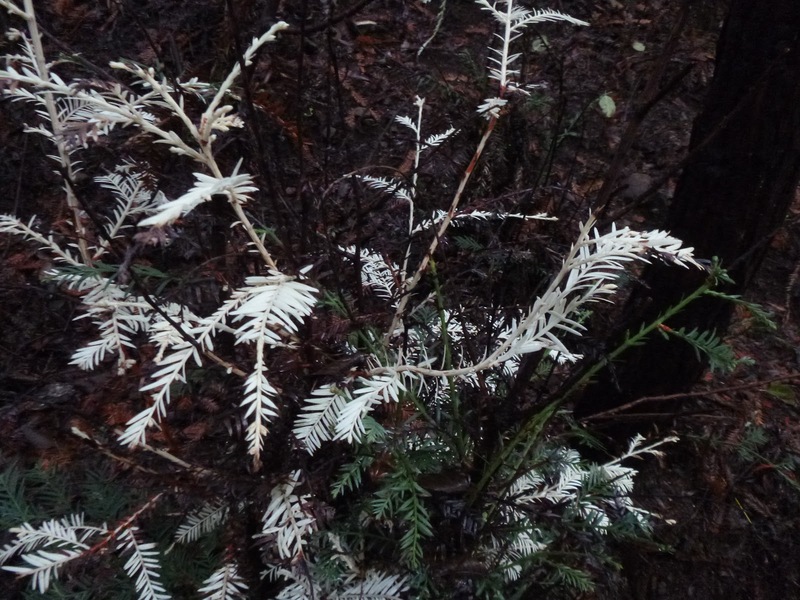 I saw a white redwood sapling along the path here -- could it be an albino? The narrow, often slippery-when-wet path goes under a bridge which accesses a creek-side house, then crosses the creek again. The next segment is rocky so use caution. Old Mill Creek gathers itself together and then drops down into what is know as "Three Wells." The rocky basins are popular bathing spots in summer. The path descends along the waterfall and then levels out. After a brief, perfectly flat stretch Old Mill Creek shoots under a bridge and continues on, but the trail ends. The junction of Throckmorton and Cascade Drive is off to the left -- you can walk back to the trailhead on the road, or retrace your steps. Nice SFGate article about Cascade Falls here. thanks so sharing all the info!!! thanks so much for sharing all the info!! !